Naturally water resistant, teak wood makes the perfect choice for bathroom accessories and teak shower benches or bath stools. 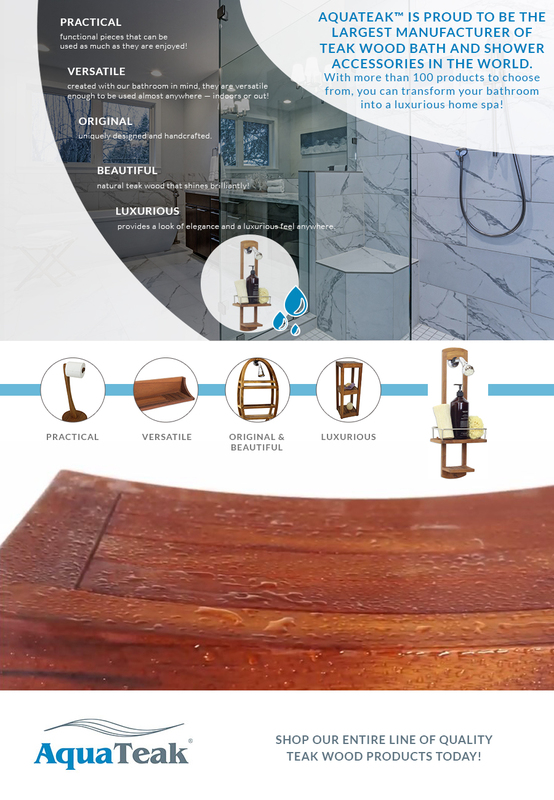 Our unique teak shower caddies and teak shower mats are meant to be highly durable even in the wettest of environments, adding long-lasting functionality and beauty as they will never corrode or pit. Our 5 year product warranty ensures the promise of durability with any AquaTeak™ product. Why Choose AquaTeak™ For Your Shower Accessories? At AquaTeak, we are proud to offer top-quality all-natural teak wood furniture that looks beautiful and provides a luxurious feel anywhere it is placed. We also strive to create functional pieces that can be used as much as they are enjoyed. Our shower and bath accessory collection offers a full line of practical solutions for use in your bathroom or spa. Who says wastebaskets can’t look great? Although they are used to hold rubbish, they don’t have to look like trash! Our teak wood wastebaskets look great and are able to stand up to the moisture that is present in baths and spas. Talk about practical! Our toilet tissue stand is not only made of gorgeous teak wood, but it also serves a practical purpose in any bathroom! Everyone uses toilet tissue, why not present it on a teak wood stand? Our teak wood shower caddies and organizers help to keep all of your shower products organized while adding an artistic look in your shower. Unlike other shower organizers, those made of teak wood do not warp or mold when they get wet! Bathrooms and spas are full of things that require easy access and storage. Our teak wood shelves offer practical solutions for any space. Whether you want a simple flat wall shelf to hold candles and other decor, a wall shelf with hooks for robe storage, or a suction cup shower shelf, AquaTeak has the perfect shower shelf to meet your needs. Although our shower accessories are created with our bathroom in mind, they are versatile enough to be used almost anywhere! Use our shelves anywhere you need them and place a teak wood wastebasket in every room of your house! Because of the natural water and mold resistance, our teak wood accessories can be used anywhere, inside and out of doors. Each of AquaTeak’s teak wood furniture pieces and accessories are uniquely designed and handcrafted. This means that you will not find the same designs in every department store. We take pride in creating original, functional pieces for our customers and their guests to enjoy. The natural beauty that teak wood provides cannot be understated. Available in a variety of colors, our teak shower accessories are sure to improve the overall look and feel of any room! If your teak accessories begin to look old or weathered, a light coat of teak oil will restore them to their naturally beautiful state. Wood furniture and accessories provide a look of elegance and a luxurious feel anywhere. Teak wood is great for all environments including bath, shower, spa, and poolside, which can help add a look of luxury to spaces that other products cannot. AquaTeak is proud to be the largest manufacturer of teak wood furniture in the world. Our quality is second to none and we guarantee satisfaction with our warranties. To start your teak wood collection, shop our entire line today!